Taryn the Alchemist is an exciting, often scary story about a teenager who finds herself in a strange land fraught with danger. All because of a magical vial of Witishink. 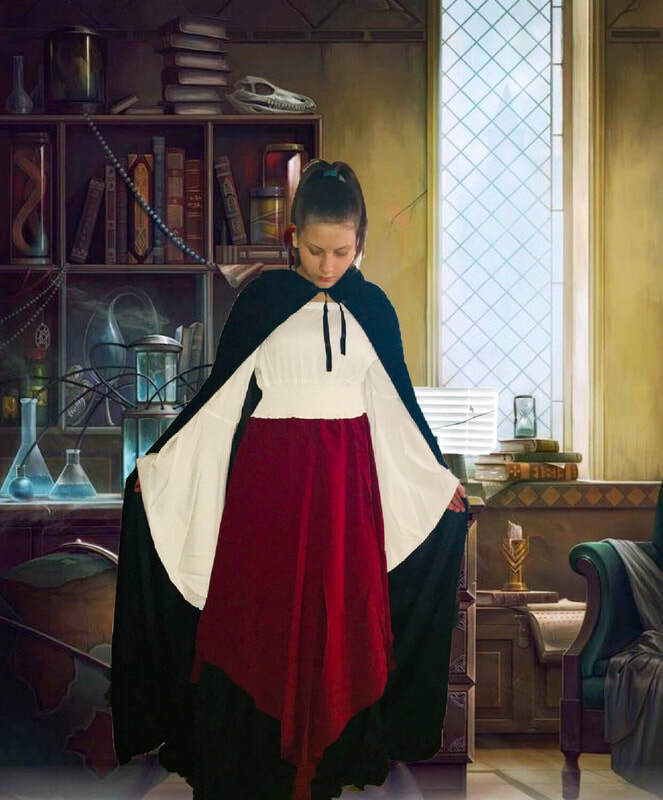 Music Score by © Minrithx - "Encounter 2"
<<<< In this Pic, Bre is trying on her amazing alchemist attire for an upcoming photo shoot that will portray her persona as the character likeness of Taryn the Alchemist in the novel by the same name - currently being penned. Photo shoot is coming soon! It all started with the blood-stained chimney! It is what comes to mind whenever Taryn remembers the old house. The chimney. Faded red brick, dusty coal-colored mortar. Perhaps three times as tall as she. Splattered with blood. Lots of blood. Its gruesome telltale mark perhaps the level of a man’s head. She and her brother Dyase had climbed the stairs. Twenty-six stairs. Two sets of thirteen. She had counted them. Twice. Just to make sure. A lantern in her hand. A quiver in her step. A lump in her throat. Too many shivers. Cloaking her arms. The nape of her neck. Running wildly up and down her spine. Dyase cowering behind her, a trembling shadow of himself. Taryn was extremely bold for a fifteen-year-old, going on sixteen on July 21, a mere two months ahead of that important night. Kids called her Taryn the Alchemist. She was not any more of an alchemist than you or I. At least not at that time in her life. But she had the gift, as you shall see. She had reached into her bag. The bag her mother gave her. It contained all sorts of magical things, powders, herbs, tiny vials of liquids whose foreign words she could not even pronounce. Good advice. However, Taryn had no inkling what all of the vials, powders, herbs and concoctions were supposed to do. But one she was quite knowledgeable of, the one containing a slimy liquid the color of a colorless moon on the cloudless wintry night. Witishink. She carefully twisted off the cork of the Witishink vial. The unmistakable putrid aroma that escaped from the vial almost made her gag. Her hands were shaking like a frail tree leaf in a powerful gale as she carefully inserted the tip of a cotton swab into the vial. She took a deep breath. Then she carefully turned the vial on its side in her trembling hand. At that precise moment, Dyase abruptly murmured, “That stuff stinks, Taryn!” Then he sneezed. Violently. As he did, he jerked his hand to his face to try to stifle the sneeze. His elbow hit Taryn’s hand, and then the unthinkable happened. A considerable amount of Witishink spilled onto Taryn's wrist. The next thing she knew, she was gone!